You’ve found the perfect wedding dress, so now you have to make sure that your bridesmaids look fabulous and complement you as well! It is just as important for them to look stunning and feel relaxed in their outfits as it is for you. You will all look more stunning on the photos and dancing the night away if you feel comfortable with what you’re wearing. Mismatched bridesmaid dresses are apparently quite the hype these days. But you need to be really careful when choosing them. Whether you go for different shades or textiles, make sure to keep a cohesive look. If you go for too many styles or too many different details, it could look quite messy. And you certainly don’t want messy wedding photos! On the other hand, going with matching dresses could give you a headache as well. 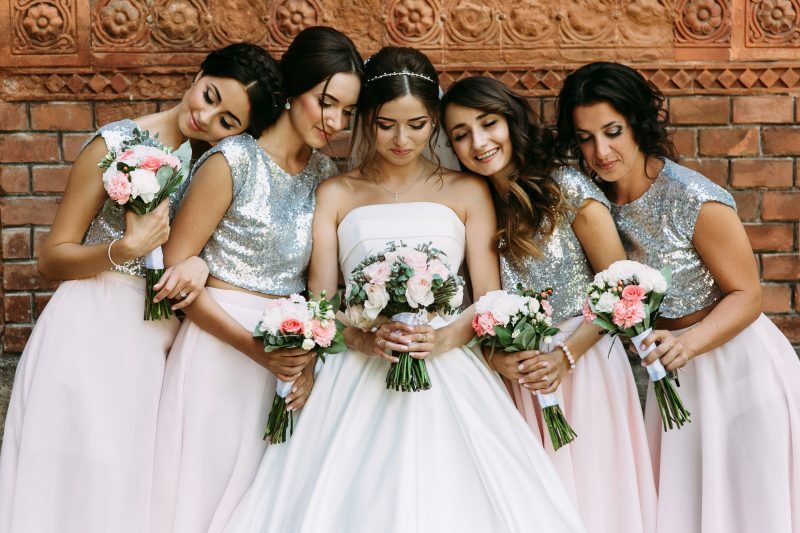 Unless your bridesmaids are identical quadruplets, they probably won’t all look the same in identical dresses. Which means you would spend quite some time on figuring out what kind of shape and color will complement each and every one of them. And be pleasing to your eye at the same time. Time of the year of your wedding is quite important for choosing the right bridesmaid dresses. Be careful not to go with autumn shades in the spring or summer reds in the winter. It could look a little off. The same goes for the time of the wedding. Especially when it comes to photos. Depending on whether you’ll be taking photos in the morning sunlight or dawn will really determine how the dresses are depicted. The material a dress is made of plays a big role here. Different materials can look completely different depending on the surrounding light. Different shades will be brought out by the natural lighting of the surroundings based on time of the day. So think about how a certain material will act if the photographer happens to use the flashlight. Or if it’s sunny outside or not. The third aspect here is the location. If you’ve decided to have a beach wedding, you can surely pull off more colorful and open dresses. Whereas getting married in winter wonderland won’t look quite so nice if your entourage is wearing dresses screaming summer time. The goal is to create a look that makes you look like a team. So, consider your bridesmaids as a whole. Look at a photo of them and ask yourself a few questions: Which colors and styles suit them best? Which dress style would look great on different body types? Let your bridesmaids try on different dresses to see which material and shape suits their personal style best. Don’t forget to consider different skin tones and what colors complement them best. If they all look comfortable in their outfits, they will make you look amazing as well!